The UK inflation rate rose to 3.5% in January - the fastest annual pace for 14 months - from 2.9% the month before, official figures have shown. Consumer Prices Index (CPI) inflation was driven up by VAT returning to 17.5% and higher petrol prices. Retail Prices Index (RPI) inflation which includes housing costs, rose to 3.7% in January, up from 2.4%. Bank of England governor Mervyn King has had to write a letter of explanation to the chancellor. A letter from the bank's governor is required if inflation is more than one percentage point above or below the government's 2% target. In it, the governor said the inflation rise was "temporary". Mr Darling responded, saying the inflation outlook was "subject to some uncertainty" as the world emerges from the "deepest downturn in modern times". The CPI inflation rate is the measure targeted by the Bank of England's interest-rate setters, while the RPI rate is often used as a benchmark in wage negotiations. The MPC's latest projections suggest that although it is likely to remain high over the next few months, inflation is more likely than not to fall back to the target [of 2%] in the second half of this year. 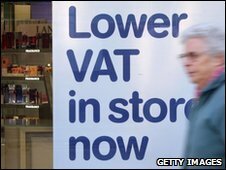 And January's VAT rise was the biggest factor raising the CPI to 3.5%, according to the Office for National Statistics. The government had reduced VAT to 15% for the previous 13 months, to try to boost consumer spending. Higher fuel and transport costs also pushed the CPI up, and last month's cold weather increased some vegetable prices, with the cost of cauliflowers rising by the highest amount since 1996. The Bank of England had warned inflation could rise to 3.5% this year but predicts it will fall back below the 2% target later in 2010. This is because the economy remains relatively weak as it continues to recover from the recession that ended in the last quarter of 2009. Most economists expect the Bank to hold off from raising interest rates given that it expects the rate of inflation to fall back. UK interest rates have been at the record low level of 0.5% for 11 consecutive months, as the Bank seeks to aid the economic recovery. However, earlier this month the Bank decided against further quantitative easing (QE), the policy designed to stimulate growth in the UK economy. Under QE, the Bank has pumped £200bn of new money into the economy by buying assets such as government bonds, as a way to boost lending by commercial banks. A number of analysts said concerns about the current high rate of inflation was likely a factor in the Bank choosing not to extend QE. However, former monetary policy committee member Professor David Blanchflower told the BBC that a spell of higher inflation would benefit the UK economy, suggesting that 4% would be a "pretty good starting point". "You would actually end up inflating some of the debt away, but also if we get into a position where house prices were to fall further we are going to have a large number of people in negative equity, and if you have a few years of inflation that actually will deal with that problem." Higher inflation would help to keep interest rates low, he added. However, the combination of higher prices and lower rates is seen as punishing those who have put money aside, as the value of their savings is eroded while the returns they make on them declines.